The Gutenberg Moment ~ In 1440 Johannes Gutenberg invented the printing press. He printed the 42-line Gutenberg Bible in 1455. In 1517 Martin Luther translated the Latin Bible into everyday German. He then printed the Lutheran Bible, challenging the Pope’s supremacy. He wanted to get back to the basics, back to the words of the bible, in the name of Protestant Reformation. Prior to this, the only people who could communicate in writing, were Catholic Priest-Scribes. Finally, with a press, a human being was able to express themself directly to their audience, in their own voice and in their own words. Guess who wanted a press next? The Pope for his bible. Next? Henry the 8th ~ The King James Bible. Ideology was being pushed with presses to the masses. In the 1500’s there was almost a 100% literacy rate, as even the poor had access to church and bibles. But not everyone could afford a press. And so the voice of the individual has been largely lost, with the exception of men like Benjamin Franklin, and Thomas Paine, who were printers and writers. Next to get presses? Bankers. More convenient than coins. And the government can print as much currency as it wants, controlling the economy. Lastly, wealthy people and politicians push and pull society with newspapers. The further filtering of information from one human being, through another human being ~ meet the reporter and the editor. And the owner of the newspaper determines the political bias their paper will have. The publisher and editor act on that implicit bias, in the manner of endorsements and editorials, especially during an election season. The physical constraints of the newspaper further effects how a story is told. What to leave out? Editorials may be a handy summary, but it makes the populace intellectually lazy. People learn more truth and facts by watching or listening the actual video of a City Council meeting, than having it summarized by another human being. Many newspapers, owners, publishers, reporters and editors really do try to seek the truth. But both the filtering of information and the physical constraints of the newspaper make that difficult. Yes, many people want the ‘sound bite’. But we all have to learn that no one person can ever give us the truth. We each must seek it out, purposefully and assiduously and unrelentingly, always willing to intellectually pivot on perspective, when new facts demand it. Infinite Content ~ Coastside Buzz is a website on the internet. You can tell a story by article/photo-essay, podcast and video. The story can be as long as it has to be, as each story gets its own webpage. A new, and significant value-added for story subjects and followers. “To Give You a Voice, in Your Own Words ​” ~ Support local content that is not editorialized, but is presented by you. Submit your own content. No content editing, except umms and ahhs. Buzz made a splash this election cycle making sure candidates were heard. Produce free (if you know how) or low-cost content (if you need help), whether via articles (photo-essays), podcasts and/or videos. Learn how to podcast at the Buzz Studios and produce your own story or show. Stories are no longer constrained by physical space like newspapers and radio. On Coastside Buzz every story gets its own infinite web page. That means infinite space for a story which can be an article, a podcast, a video, or all three. Tell your story, the way you want to tell it. Come play and help us produce great local content. Free Self-Submit Coastside Buzz Calendar​ ~ Access 24/7/365 from any device. Find all the live music, community events, government meetings, senior activities and foodie specials happening on the Coastside. Missing something? Enter your event from your phone!! The Buzz Bees will approve your entry within 24-hours. Enter as early as you can. If you want to promote your event on the Coastside Buzz Facebook feed, it costs $25 for post labor. Post your event and the Buzz Bees will share to our Coastside Buzz Facebook feed. If you want to Ad Boost the Facebook post, usually $10, does the job. Comprehensive Coastside Buzz Directory ~​ It is only $250/year for your own webpage on Coastside Buzz! Your web page includes business name, address/map, phone, email, website link, photos, descriptive text for hours, and more. Access your webpage 24/7/365 from any device. Buzz Bees will promote the Directory once a week, highlighting a business, via the Buzz Email and Coastside Buzz Facebook Ad Boost. Promotion Pace ​~ Coastside Buzz will promote the Directory, Calendar and some form of content once a week, with a Boosted Facebook Ad. By end of 2018, Coastside Buzz will promote through Instagram, Twitter, NextDoor, and Pinterest daily. Email Subscription ​~ Please subscribe to our Coastside Buzz Mail. Each month (working towards once a week by 2018). Each week people will be reminded of an event on the calendar, a new entry in the Business Directory and new content for the week. There is a media revolution happening ~ The Gutenberg Moment. Buzz strives to provide free to low-cost internet content in the form of photo-essays, podcasts, videos. There is also a free self-submit Buzz Calendar, that can be accessed 24/7/365, from any device. Self-submit calendar. Self-submission reduces labor costs. Auto-renew directory technology. Sell once. Citizen reporters producing content by themselves and we simply distribute for free. If the producer wants social media promotion, that costs extra, but not very much. Depends on reach, frequency and Facebook Ad Boost spend. Lots of people have something to say, they just need distribution. The submitted content will be curated for tone, accuracy, spelling, etc.. Local businesses can sponsor beats so reporters can be paid. Want the Buzz Bees to produce for you? We can do that for a low $50/hour labor fee. A podcast or video can cost as little as $250 and you can use it as a reference for a long time. Great for candidates, story tellers, musicians, artists … anyone who has something to say! The nominal costs keep labor overhead down, yet gives as much access as possible. Social Media Promotion Wash. Buzz Directory includes an intitial $10 Buzz Facebook boost. After the initial boost, each Directory client is referred to the Buzz Social Media Department where they are helped further using Buzz and other social media platforms to promote their business. This is a pass-through as the Directory client pays the social media contractors directly. DIRECTORY: The Coastside Buzz Directory – $250/year. Promote your business on the internet. Less expensive than 1 1⁄8 page ad in the local newspaper for one week!! There is no comprehensive directory or calendar on the coast. 2016 was the build. 2017 is move in and push SEO. Please support the Directory in order to bring the Coastside together. Supporting the Directory, supports Buzz content, and our community. HOME PAGE PRIMARY THUMBNAIL: Logo Click-Links to your website or your Buzz Directory webpage, if you don’t have a website. Your logo click-link will show up first, at top of sidebar, on computer, and first at end of feed on mobile. $500/qtr..
HOME PAGE SECONDARY THUMBNAILS (4): Logo Click-Links to your website or your Buzz Directory webpage, if you don’t have a website. Your logo click-link will show up on the sidebar on computer, and at end of feed on mobile. $250/qtr..
CALENDAR BANNER: Top of page banner for $500/qtr..
CALENDAR PAGE PRIMARY THUMBNAIL: Logo Click-Links to your website or your Buzz Directory webpage, if you don’t have a website. Your logo click-link will show up first, at top of sidebar, on computer, and first at end of feed on mobile. $500/qtr..
CALENDAR PAGE SECONDARY THUMBNAILS (4): Logo Click-Links to your website or your Buzz Directory webpage, if you don’t have a website. Your logo click-link will show up on the sidebar on computer, and at end of feed on mobile. Use these multiple thumbnails to brand different aspects of your business. $250/qtr..
SHOW SPONSOR​: Sponsor a Buzz Show. There are 7 pilot shows to choose from. Prefer quarterly investment to allow social media and SEO to get the show and your business attention. $3,000/qtr., $12,000/year. COAST VIEWS MUSIC CALENDAR: Kellie Morlock’s famous weekly live music calendar. Get your logo/photo/graphic at the top of the CVM Calendar pdf. At least a 1,000 eyes on this calendar each week. Includes approx. 300 musicians via the CVM email and from 300-1,200 on Facebook and the Buzz Email. $250/week. BUZZ EMAIL: New this year ~Be the sponsor of the Weekly Buzz Mail. This weekly email will include the latest content, events and happenings, while promoting local businesses. Almost 300 subscribers, already. Shared and boosted to social media, too. $250/week. 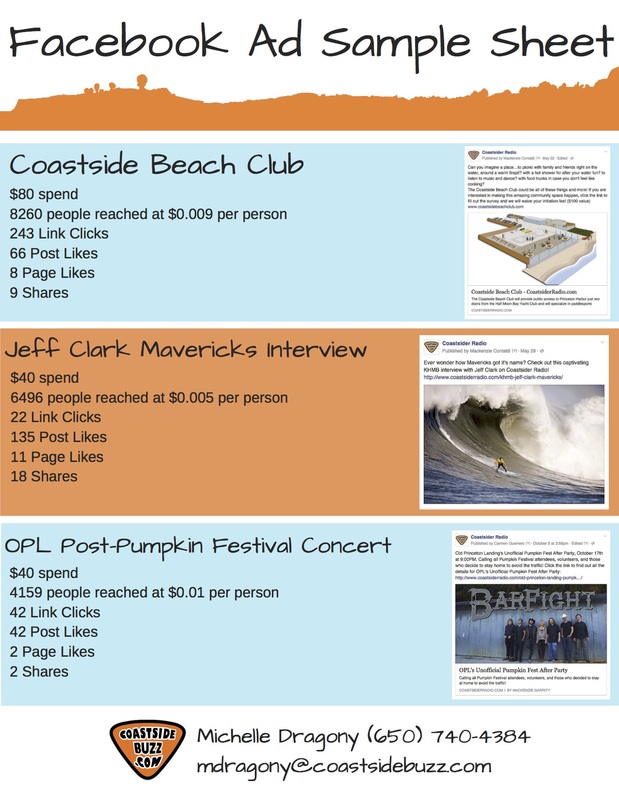 SOCIAL MEDIA POST and BOOST: If you want to promote your event on the Coastside Buzz Facebook feed, it costs $50 for post and boost labor (includes $10 Ad Boost). NOTE: Valuation of promotions will increase over time! Bedtime Stories ~ Listen as Michelle Dragony and others read their favorite bedtime stories! Come to the Buzz studios to record, or learn how to record, or read into your phone and send us the mp3. Traveling parents? Read a BTS and your child can hear your voice no matter where you are! Grandparents? Read a BTS and after your visit your grand kids can listen to you 24/7/365, from any device! Bedtime Stories can help teach your child to read on their own! Use as an Early Reader and ESL Independent Reading Tutor. Podcasts only. Looking for 1 major sponsor to brand with. $250/show, 1 podcast per week, $12,000/year. Includes full social media push and exposure on each Coastside Buzz Email. Michelle Dragony interviews restaurateurs, musicians, artists, politicians, health professionals and whoever she happens to come upon. You know someone who has something to promote or talk about? Send them to Buzz! Articles, podcasts, videos. ​Harry the Y (Harry Ysselstein) interviews musicians from the coast or visiting the coast. If you know a musician who would like to tell their story have them contact Buzz! Buzz is building a Coastside History page that will become a go-to reference for local teachers, and visitors. Help sponsor this show and all proceeds will go to the HMB History Association to help them build a HMB museum!